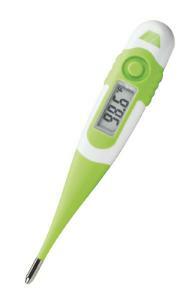 The soft, flexible tip on this waterproof Fahrenheit thermometer conforms to the shape of the mouth for a safe and comfortable reading. The easy-to-read, large display screen emits a tone at peak temperature. Its auto shut off feature saves power. Ordering information: This kit includes five probe covers, a storage case, instructions, and a lifetime limited manufacturer's warranty.